Okay, so I have sat staring at a blank screen long enough. It’s time to Just Begin. I have a lot of thoughts running through my head and I’m struggling to get them from head to print. It’s an issue that’s been plaguing me for some time. It got particularly bad right after my surgery this past November. My guess is that the anesthesia had a role in the brain fog. But then I got to thinking about how there has been a piece of me missing ever since I had my Stroke of Luck. It’s nothing drastic, but there has been a barrier that I have felt when trying to have thoughts at a deeper level. I’m sure there is a word for it, but, ironically, I wouldn’t be able come up with it anyway. This realization was a secondary reason for me taking a bit of a hiatus on the blog. I stopped liking what I was putting out, because I wasn’t able to transfer my thought process into sufficient words. Honestly, I still feel at odds with my writing, but I also feel that itch I get when writing is the only outlet that can scratch it. So, here I am. Topics that have been on my mind include: the shame I feel having a mental illness that requires prescription medication, the paradox of motherhood, life on survival mode, humbling myself, making sure I’m making the most out of this time in my life, and my struggle with distorted thinking. Seeing as how the latter is the easiest matter for me to express, let’s start there. When I started this blog, at the encouragement of a friend, I was telling her how I wanted to talk about all the things I learned in therapy about my distorted thinking. She kept saying that the term wasn’t clear enough and therefore needed some tweaking. So, let me start by sharing what I believe to be the best analogy for distorted thinking. Imagine you have a kaleidoscope with loads of pretty gems in it. If you took the kaleidoscope outside on a beautiful day and looked at flowers, it would distort the natural beauty of the flowers. It would still have its own beauty, since the kaleidoscope was filled with pretty gems, but it’s distorted nonetheless. Now imagine you have a kaleidoscope with coal and dirt in place of gems. How do you envision those flowers looking as you gaze through the kaleidoscope of filth? Now imagine your thought process was continually looking through that same dirt-filled kaleidoscope. That is what my thought process did, for years, with several aspects of my life. I still catch myself battling it, but I was taught methods, in therapy, to recognize and squelch that way of thinking when it resurfaces. Some people think that therapy is a place they go to for a quick fix or, worse, a place where they can figure out who to blame from their childhood for their distorted thinking or lot in life. I’m not saying that our childhoods don’t have an impact on our lives and who we become, they most certainly do. However, I find that successful therapy is achieved upon acknowledging things that have happened, moving past them, and working, truly working, on the here and now of the problem. Even if there was a source from my childhood for my acquired distorted thought process, what good would have come from placing blame? For me, the solution came in getting to the root of the problem and allowing myself to grow, not hunting down the planter and yelling at them for not planting me in optimal sunlight. I use the term “planter” loosely, not as an analogy for a parent or any one person, but as a source beyond my control. The healthiest way to make emotional progress is to be accountable for your actions, and realize there is no quick fix. At the time when I was sincerely ready to attend therapy, I had to address the fact that some of what I felt jaded about was not really even happening. For instance, in my mind, any compliment given to me was only out of obligation or a form of manipulation. Somehow I couldn’t take a compliment as a sincere gesture of someone’s amiable feelings towards me. How could I feel good about myself when I wouldn’t even accept that there was good in me? The flip side to this is when, someone really did think less of me, and I automatically took their thoughts as truth. 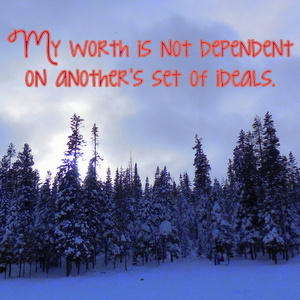 My worth is not dependent on another’s set of ideals, and yet somehow I still struggle to think of it as such. It’s this way of distorted thinking that has left me feeling shame for my mental illness and my use of medications for proper treatment. However, that topic is for a whole other day. For today, I think the message I want to send out into the world is simply to become aware of distorted thoughts that you may be having, perhaps unknowingly, and try to debunk them so that they do not consume you. Also, don’t let your worth be dependent on another’s set of ideals. And, lastly, progress can be made, but First You Must Begin. This post would not have come to pass, if I hadn’t simply begun and let my thoughts land where they may.